The stakes for UFC 118‘s other lightweight bout have just been raised, as UFC president Dana White confirmed the winner of Kenny Florian vs. Gray Maynard would indeed be the next No. 1 contender for the 155-pound title. At first, it seemed as though White had only committed to granting a title shot to Maynard if he were to beat the former “The Ultimate Fighter 1” runner-up. “If Gray Maynard beats Kenny Florian he deserves a title shot. No doubt about it,” White stated at Wednesday’s press conference. This led to a bit of confusion as to where Florian stood in the championship picture, which prompted the obvious follow-up question. 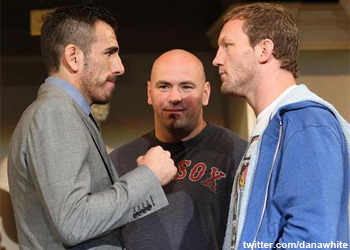 Would the winner of Saturday night’s lightweight bout between Gray Maynard and Kenny Florian earn a crack at the crown? The promoter then went on to clarify his previous statement, saying that the reason he mentioned Maynard specifically was because many people felt the Xtreme Couture fighter may have been unfairly leapfrogged by current champion Frankie Edgar at UFC 112 this past April. “My thing is, if [Gray] beats Kenny Florian – whether he submits him, finishes him or squeaks out a close decision – you beat Kenny Florian. Definitely, you’re in there,” the face of the UFC explained. A win for Florian would guarantee his third 155-pound title bout in the UFC, while a Maynard victory would solidify his first attempt at the strap.